It’s no secret that I’m a fan of ketamine and its clinical applications. So when I spotted this paper in my daily PubMed notification email (see here for tips from the St Emlyn’s team on how to set these up) I was immediately interested. Even before I was an EM trainee I worked in an adult hospice where I learned about ketamine’s use in patients with opioid-resistant pain and I recently had cause to discuss with our local pain service their protocol for ketamine administration to a chronic pain patient whose daily opioid requirement would have floored a herd of circus animals. In true JC style you’ll find a link to the original paper (the lead author is on Twitter too – so Sergey, if you want to chat about the paper on the St Emlyn’s podcast, get in touch!) and some FCEM-style questions to help develop your critical appraisal skills. 1. For induction of anaesthesia (dissociation expected). Typically this dose is around 1-1.5mg/kg. 2. To enable control of the agitated patient or for short painful procedures – for example, to enable DSI or for paediatric procedural sedation. Usually this dose is around 0.5-1mg/kg; dissociation can reasonably be expected at doses 1mg/kg and above. 3. For analgesia at sub-dissociative dosages, from 0.1-0.6mg/kg. Our local pain service advocates 0.25mg/kg dosing, repeated up to three times. For advice on this, please contact your local pain team! In this paper the aim was to provide analgesia without dissociation. Dissociation can be extremely unpleasant, more so for adults than for children – listen to the description of Cliff Reid’s trip down the K-hole over at the RAGE podcast to understand it better. Patients who presented to the ED with “moderate to severe” pain (abdominal, flank, back or musculoskeletal, scoring 5/10 or above on a 0-10 pain scale, for whom intravenous opioids would normally be considered) were randomised to receive either morphine or ketamine intravenously. Pain scores were recorded at intervals (15mins, 30mins, 60mins, 90mins and 120mins) and the investigators looked for a comparative decrease in average pain score between the two groups at each time point. The study was powered to detect a difference of 1.3 in pain score with an alpha set at 5%. Although there was some dropout in the later stages of the study as patients were discharged or transferred out of the ED, all 90 recruited patients’ data was recorded at the primary end point of 30mins. What we are looking for in the results table 2 (“pain trends”) is for the 95% confidence interval to cross zero – remember the confidence interval expresses the range of values between which we can be 95% certain that the true population value (in this case, the difference in pain scores between patients given morphine and those given ketamine) lies. If we find the confidence interval doesn’t include zero we can’t necessarily infer superiority (that one drug is better than the other) from this study but we can’t conclude that the medications are equivalent. If you feel particularly smart, have a read of this nice little FOAM resource on superiority, equivalence and non-inferiority trials. At 30mins after administration, the difference in mean pain scores between the two groups was 0.2 (95% confidence interval -1.19 to 1.46). The authors conclude that this suggests that intravenous ketamine at sub-dissociative doses is as effective as morphine in providing analgesia at 30mins (they try to sneak in an “and at 15mins” here too, but since that wasn’t their primary outcome measure I’m not allowing it!). Remember: not finding a difference does not prove equivalence! They found no difference in the incidence of rescue medication usage (fentanyl) nor in the incidence of adverse effects. More patients in the ketamine group reported adverse effects immediately after administration and in the first fifteen minutes, but this pattern did not persist to the later timepoints. 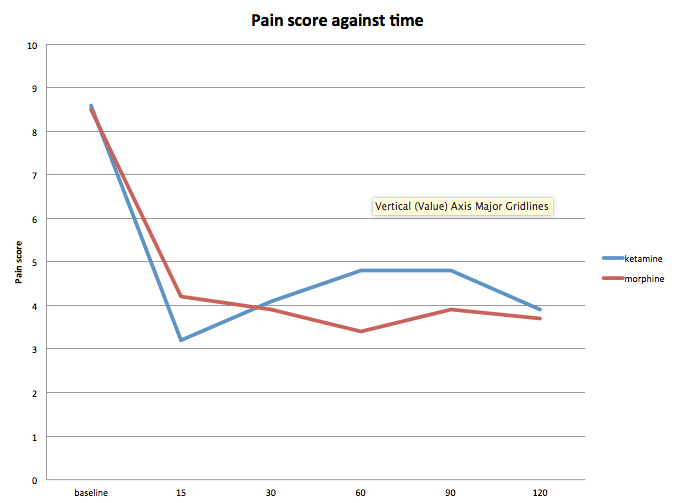 You should really have a look at table 2 in this paper which maps out pain scores over time. The authors did not plot the data, but a quick whizz into excel illustrates the point that there may be differences between the two drugs in terms of speed of action and also persistence of effect. Whilst the average pain score looks similar, the number of pain free patients appears different over time. Graphically presented an impression is given that Ketamine works faster, but perhaps wears off faster too with a non statistical increase in patients requiring rescue fentanyl in the ketamine group. We would expect that from the pharmacology of ketamine and morphine and this has implications for how we might use these drugs in practice. Perhaps ketamine is a great starter drug, but needs to be combined with something longer acting. The authors concede that this was a single-centre study (I’m not sure that’s such a big problem) and perhaps more importantly that they were bang on their recruitment target to achieve their 80% power as per the sample size calculation. They have also identified some potential issues with protection of the blinding; some patients in the study had nystagmus, a finding often seen with ketamine administration but not usually associated with morphine use. Don’t forget this was also a convenience sample; it’s very practical in the ED to only recruit during the hours when researchers are available but it can open the study up to bias if subjects are not truly randomly selected. One of the biggest problems with this type of study is the use of subjective end-points and it’s really difficult to find ways to overcome that. While pain scores convert subjective measures into numerical values, it can be very difficult to ensure a valid and reliable measurement as previous studies have shown. Lastly, not finding a difference between pain scores for ketamine and morphine does not mean they are equivalent. This study is powered to be a superiority study but superiority was not demonstrated. In the wise words of Rick Body, in a superiority trial protocol deviations tend to produce a conservative effect, reducing the chances of positive findings. In a non-inferiority trial the opposite is true – lots of deviations make it more likely that you’ll find no difference between the treatments and the trial will be positive. A non-inferiority trial therefore has to be particularly rigorous. Intention to treat is also important for superiority trials as it makes findings more conservative, but per protocol is better for non-inferiority. This reads like a non-inferiority trial but it isn’t one: the authors haven’t demonstrated non-inferiority, they have just failed to demonstrate superiority and this is not the same thing. On the whole this is a nice little study suggesting that ketamine provides reasonable analgesia at low doses. The problem we have is that ketamine is still hard to come by – and if we know morphine works, why can’t we just use that? The real power of ketamine for pain in the ED is for those patients already on large doses of opioids – and this study doesn’t address that population. Previous: Previous post: Join St.Emlyn’s at SMACC in Chicago. You know you should. The third world anaesthetic is now becoming the first world critical care drug of the 21st century. But I do sometimes wonder if it is being embrace a little too enthusiastically before it has an established evidence base. Certainly I am finding that some exponents are now using it almost as a first line drug for agitated mental health patients and analgesia in multi-trauma; typically after trivial doses of conventional drugs. There are downstream effects when pre-hospital personnel employ it in trauma resulting in difficulties to perform physical and mental state evaluations. I suspect (but cannot prove) we are now doing more pan-scans on only moderately injured patients simply because we cannot properly assess them post-ketamine. By all means let it be part of our pharmacological armamentarium but don’t it be its chief substitute unless there is good reason to.